Guwahati, Dec 8 : Climate change leading to natural disasters, particularly flood and erosion, has affected the livelihood options of thousands of people across Assam, a study has found out. The impact of the climate change is most pronounced among marginalised women, but it has also pushed people from prosperous families into taking up work of domestic assistance and daily wage labour, the study revealed. In many cases, young women of less developed and remote areas have even been pushed into flesh trade after natural disasters wiped out their options of making an honest livelihood. The study was conducted by the Centre for Environment, Social and Policy Research (CESPR) in collaboration with the Indian Network on Ethics and Climate Change. It has been observed that during the last few years there has been a significant change in the livelihood options of people due to climate distortions, CESPR spokesperson Sabita Devi says. 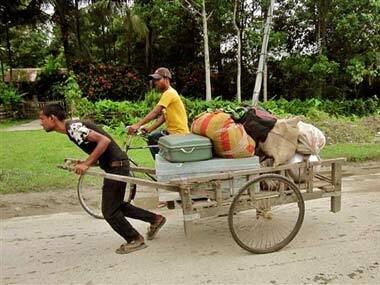 The study was undertaken in the six severely disaster-affected districts of Lakhimpur, Majuli in Jorhat. Morigaon, Sonitpur, Baksa and Dibrugarh. Devi said many people, who were earlier dependent on agriculture, had been forced to take up other avenues of employment due to change in climatic pattern. “Climate change is generally perceived by the people interviewed during the course of the study as the presence of more diseases, more rainfall, change in climatic conditions and loss of agricultural output,” she said. It was also an acute necessity that forced people to uproot themselves from their original homes and workplaces to seek livelihood somewhere, Devi said. Devi pointed out that senior environmental scientists, who have worked extensively on environment and climate change in the Northeast, had noted rapid climatic change in Assam. According to meteorological scientists who have been associated with studies related to climate in Assam, a change over the past three or four decades and a steady rise in temperature have been observed. “Due to excessive floods, communication is disrupted for long periods of time and this has particularly affected the girls who are often forced to drop out of schools and colleges,” she said. Besides, the adverse impact of the flood on the income of the family often forces the women of the house to step out and seek work elsewhere and when this happens, the children, too, suffer, Devi pointed out. Assam’s devastating floods have had a major impact on the economic conditions of several households, Siddharth D’Souza of the Indian Network on Ethic and Climate Change pointed out. “This has also made young girls from the tea garden areas vulnerable as they are lured with the promise of jobs but are instead pushed into into flesh trade,” D’Souza said. “We have come across several instances when some anti social elements had tried to lure away young women outside the state with promises of good job,” social activist Krishna Sundas said. In Majuli, the world’s largest river island, women who were earlier home-makers are now forced to take up weaving, daily wage labour and other related activities to make ends meet, while in Morigaon several households are taking up fishing to make up for lost agricultural produce, he said.